Geographical Range: The natural range is Southern China and Taiwan, but introduced populations are found elsewhere. Diet in the Wild: Grasses, leaves, shoots, and fallen fruits. At full growth they can be about 3 feet long and stand about 16" at the shoulder. Weight is from 20-30 lbs. They are reddish brown in color. The chin and throat are white and there is a black stripe along the neck. The males have short antlers. Females have small, bony knobs and tufts of hair on their heads, instead of antlers. 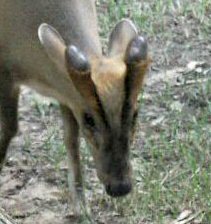 Males have a prominent V-shaped marking running into the base of the antlers, while females have a more diamond-shaped marking on the head. Solitary, pairs or small groups. Both males and females defend small territories. The Reeve's muntjac has two very large teeth. The two large canines of males are used in competition for females. Females have smaller tusks. 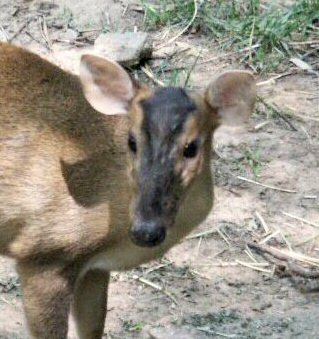 Muntjacs also have a scent gland under each eye that they use to mark sticks with, by poking the stick into the gland. 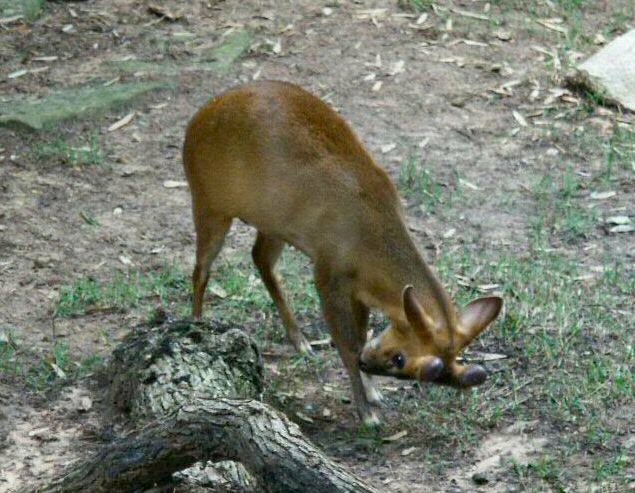 Muntjacs are called "barking deer," because males have a barking call, used both as an alarm signal, and also during the mating season. They can mate year-round, but they mostly mate in January and February. Gestation is 7 months. They give birth to 1-2 young for every birth. The young stay hidden in the brush until they are strong enough to move around with their mothers. Captive muntjacs have been released into the English countryside and are now found throughout England as an introduced species. They are shy and keep to themselves. They enjoy lying in the shade and grooming themselves.